Perfect fire escape plan software with rich examples and template. 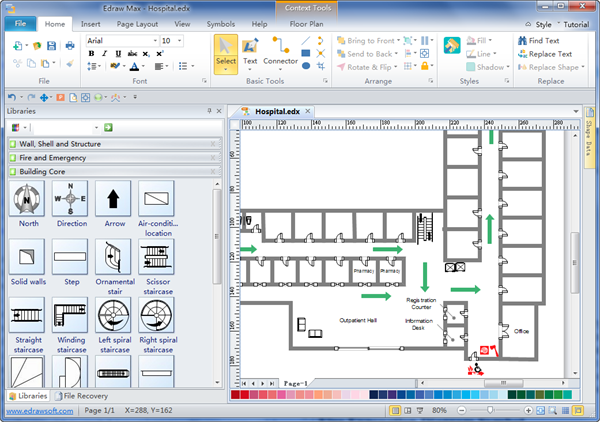 Edraw is ideal for graphics designers and developers who need to draw fire escape plans. Draw fire escape plan easily with Edraw Max! No drawing skill is required. Is it possible to finish a fire escape plan in less than 10 minutes? Can people without any drawing basics draw a fire escape plan? 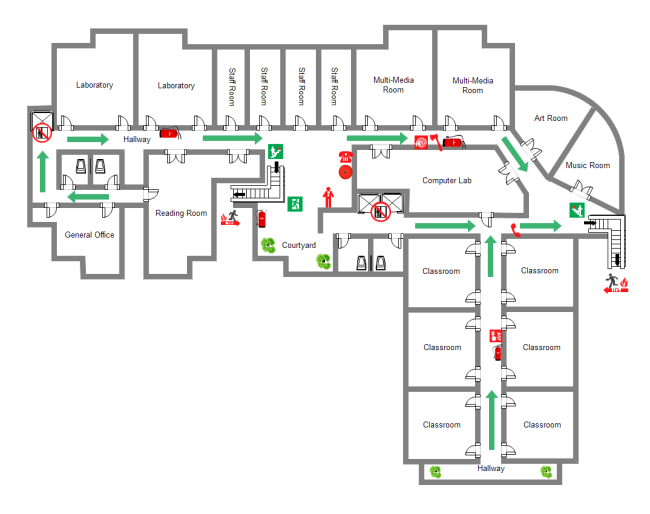 Are there any ready-made fire escape plans templates that are printable, editable and free? The answer is yes. You can find solutions for all the above problems in Edraw fire escape plan software. It has a drag and drop interface accompanied with a wealth of predefined shapes so that even beginners without any drawing skill can make a fire escape plan within 5 minutes. It also offers many templates and examples in various formats. After you download Edraw, a lot more amazing things will be available at your fingertips. To compare users to cooks, Edraw's predefined symbols are like the ingredients needed for yummy delicacy. They are all well prepared in the right size. Users only need to mix the "ingredients" together and "cook them". And then enjoy. 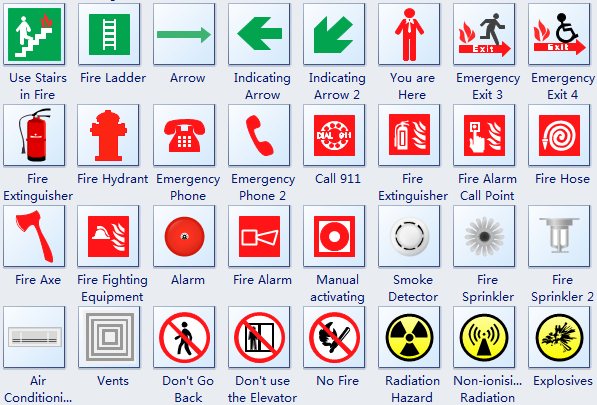 Learn more about them in Fire and Emergency Plan Symbols. Instead of starting from scratch, you can leave the difficulties to others and only do some simple things when time is limited. This also applies to making fire escape plans. The fast and easy way is to begin from a well-designed example just like the following school evacuation plan created by Edraw. Here is another complete fire and emergency plan example made with Edraw. 1. Start Edraw and choose Floor Plans category. -> Double click the icon of Fire and Emergency Plan to open the template. 2. Drag necessary shapes onto the canvas. -> Connect them through the connection points. -> Move them in the suitable location. 3. Add text to describe what the symbols stand for. You must always remember that your ability to get out depends on advance warning from smoke alarms and advance planning. The following tips are very useful for emergency escape. Create a home escape plan and present it to all family members. Preparedness can prevent panic. For company, create an emergency action plan for all employees. Practice a home fire escape plan. More practice will help people respond more quickly. If you live in a dorm, make sure that you're familiar with the building's escape plan and that you participate in fire escape drills. Make the drill as realistic as possible. Smoke alarms: Some studies have shown that children may not awaken to the sound of the smoke alarm. Assign people to wake them up during emergencies. Try to let all members involve in the design of fire escapes plan. Walk through your house and inspect all possible exits and escape routes. Clear obstacles on the escape routs. Mark two ways out of each room, including windows and doors. Also, make the location of each smoke alarm visible. For easy planning, download Edraw's escape planning software. This is an effective way to get children involved in fire safety in a non-threatening way. Everyone in the household must understand the escape plan. When you walk through your plan, check to make sure the escape routes are clear and doors and windows can be easily opened. Check the device to open window bar often. Go outside to make sure that your street number is clearly visible. If not, paint it on the curb or install house numbers to ensure that fire department personnel can find your home as soon as possible. If there are infants, elder adults, or family members with mobility limitations, make sure that someone is assigned to assist them in the fire drill and in the event of an emergency. Assign a backup person as well, in case the designee is not home during the emergency. Tell guests or visitors to your home about your house's fire escape routes. When staying overnight at others' homes, ask about their escape plan. If they don't have a plan in place, offer to help them make one. It won't take long but will be of great significance in the case of accident. This is especially necessary when children are permitted to attend "sleepovers" at friends' homes. Once you're out, stay out! Never go back into a burning building. If someone is missing, inform the fire department dispatcher when you call. Firefighters have the skills and equipment to perform rescues.